Pakistan Says Drones Killed Far Fewer Civilians Than Thought : The Two-Way Human rights groups and Pakistani officials have condemned the number of civilian casualties in such attacks, but the country's defense ministry says just 3 percent are civilians. A U.S. Predator drone flies over Kandahar Air Field, southern Afghanistan. While human rights groups and other watchdogs have put the civilian death toll in the hundreds, Pakistan's Ministry of Defense announced Wednesday that just 3 percent of the deaths from U.S. drone strikes since 2008 were noncombatants. 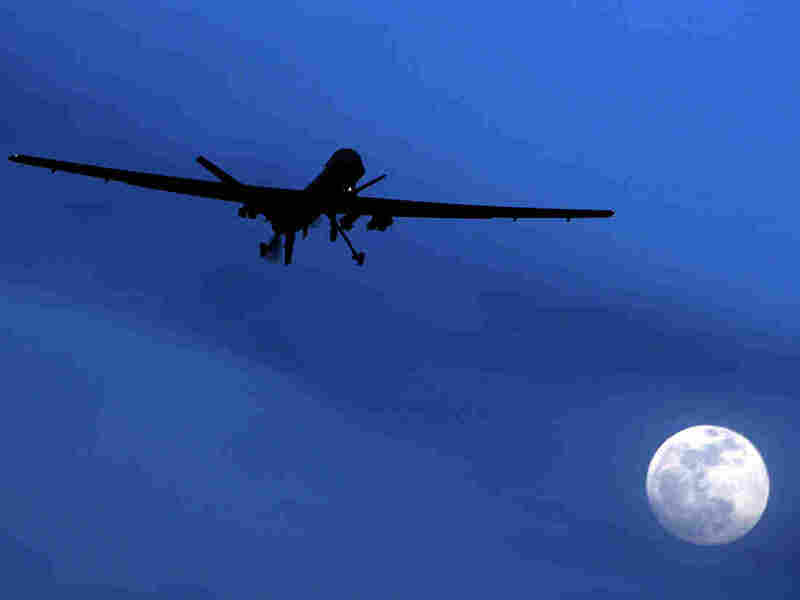 The ministry says 317 drone strikes have killed 2,160 Islamic militants and 67 civilians in the last five years. According to Pakistan's Dawn newspaper, the ministry also says there hasn't been a single civilian death from a U.S. drone since January 2012 — a time period that saw 300 such strikes carried out in Pakistani territory. "[This] year has witnessed the lowest number of drone strikes which are 14 as compared to 2010 when the US hit Pakistan's Federally Administered Tribal Areas 115 times through drone attacks." Even so, the strikes have been publicly condemned by Islamabad and were reportedly the subject of discussions last week between Prime Minister Nawaz Sharif and President Obama during the Pakistani leader's visit to Washington. The Pakistan Defense Ministry's conclusion is similar to one reached by the U.S. Army War College in a report that we wrote about last month. The War College report said 26 militants were killed for every confirmed civilian death, a ratio that comes out to just under 4 percent. A United Nations expert said earlier this month, however, that at least 400 civilians had been killed since 2004, or about 18 percent of the total 2,200 drone strike deaths.